It can be difficult to see where shoreline ends and sea begins when more than a third of the estimated seven million wading birds that use the Atlantic flyway are at Banc d’Arguin, the world’s largest concentration of wintering waders. Records exist of more than two million broad-billed sandpipers alone—and there are hundreds of thousands of black terns, gray and ringed plovers,knots, dunlins, European spoonbills, bar-tailed godwits, redshanks, greater and lesser flamingos, and others, plus some three million land birds. Vast shallow tidal flats and sea-grass meadows just offshore offer cover, sustenance, and important breeding and nursery grounds to millions of sea organisms in crystalline waters covering some 300 square miles (800 km2). Nowhere deeper than 16.5 feet (5 m) at low tide, they extend nearly 35 miles (60 km) out from shore for some 100 miles (160 km) along the coast, one of the richest marine areas in the world, sustained by cold, nutrient-filled waters of the Sahelian upwelling. The enormous aquatic population ranging from fish to microplankton attracts larger sea creatures, including killer whales and five species of dolphins and porpoises. It also feeds one of the world’s most diverse breeding colonies of fish-eating birds crowding shoulder-to-shoulder on more than a dozen small islands during twice-yearly nesting seasons—thousands of white pelicans, white-breasted and reed cormorants, gull-billed, Caspian, royal and common terns, and others. Four species of sea turtles lay eggs on the beaches—loggerheads, green, hawksbill and huge leatherbacks, world’s largest, known to reach a shell length up to 6.5 feet (2 m) and weigh close to a ton (800 kg). This 4,530-square-mile (11,750-km2) U.N. World Heritage Site, designated a Ramsar Wetland of World Importance, is at the migratory limit of both Afrotropical species and palearctics from the northern hemisphere. Half marine, half terrestrial, some 7,440 acres (3,100 ha) is an ancient mangrove swamp dating from a humid past when Banc d’Arguin was a vast estuary draining freshwater rivers flowing from the then-green Sahara. On the land side are small, stocky, sand cats with ringed tails, jackals, honey badgers or ratels, fennec and sand fox, striped hyenas, possibly relict populations of pale dorcas gazelles, and Imraguen tribesmen who live by subsistence fishing using traditional sailing boats in ways unchanged since first described by 15th-century European explorers. Fishermen act cooperatively with wild dolphins to catch schools of gray mullet. Park access is possible along a road between Nouadhibou and the capital, Nouakchott, which has an international jetport and where guided tours can be arranged both on land via 4WD and sometimes by water. Both have lodgings and are linked by local airlines. Permission is necessary for entry and can be denied at height of the April–July and October–January breeding seasons—check ahead. Best times are slightly cooler December–February—but Mauritania is hot most of the time. Most serious threat is from international factory fishing fleets subsidized by Japan, Russia, Ireland, and the European Economic Community, which in some places have devastated fish populations and turned local fishermen from traditional to more damaging methods such as large-scale netting and dynamite. Funding is needed for patrols, and the government has been urged to negotiate stronger protective agreements with these countries. World Wide Fund for Nature (WWF), the French Ministry of Cooperation, and the Netherlands government all have agreed to help, with marine equipment as well as mounted camel patrols on the land side. The new Diawling National Park, a saline floodplain with great numbers of waterfowl and wading birds in the lower delta of the Senegal River adjoining Senegal’s DJOUDJ NATIONAL PARK. Another Ramsar site has been recommended, Aftout-es-Saheli, to protect one of the last undisturbed wetlands on the Mauritanian side of the Senegal delta, also Lake Aleg and Lake Rkiz to protect inundated forests. 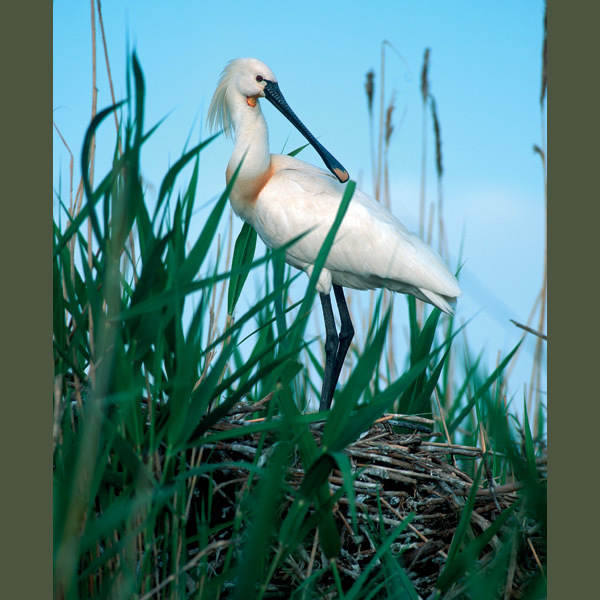 Spoonbills feed by swishing their long, spatulate bills through shallow water until they encounter prey, such as water insects, fry, crustaceans, or small frogs, which they snap up and ingest. In breeding plumage, they develop distinctive “horse-tail” crests. They are voiceless except for grumbling sounds when strangers approach the nest. Found in shallows, reedy marshes, estuaries over southern Russia and central Asia, they winter in East Africa and South Asia.